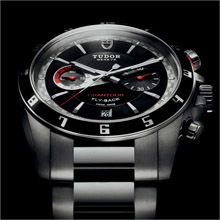 This year, TUDOR is giving a new dimension to the Grantour line, its collection devoted to passion for motor sports, by redesigning its Grantour Date and Grantour Chrono models and introducing a new model : the Grantour Chrono Fly-Back. This most recent addition to the collection allows consecutive time intervals to be measured rapidly thanks to its on the fly chronograph reset and instant restart functions. With the same 42 mm case as the Grantour Date and Grantour Chrono models, this new model is equipped with a Fly-Back pusher that has a red marking. 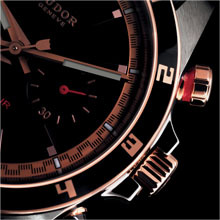 The small seconds hand counter at 9 o’clock is set in a background motif reminiscent of automobile transmission belts. 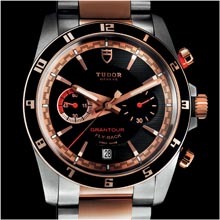 The Grantour Chrono Fly-Back model is available in steel and in a combination of steel and 18 ct pink gold, a first for the TUDOR brand. All the models in the Grantour line are equipped with bistable pushers that are lockable at one eighth of a turn, and satin-finished streamlined lugs that have a distinctly technical look. Other features such as the new bevelled hour markers and the flange with minute markers are among some of this year’s enhancements to the Grantour Date, Chrono and Chrono Fly-Back models. The Grantour Date, Chrono and Chrono Fly-Back models are available with a satinfinished three-piece link steel bracelet with a polished centre piece, or a sporty leather strap with large or micro-perforations and a folding clasp with a new safety catch.